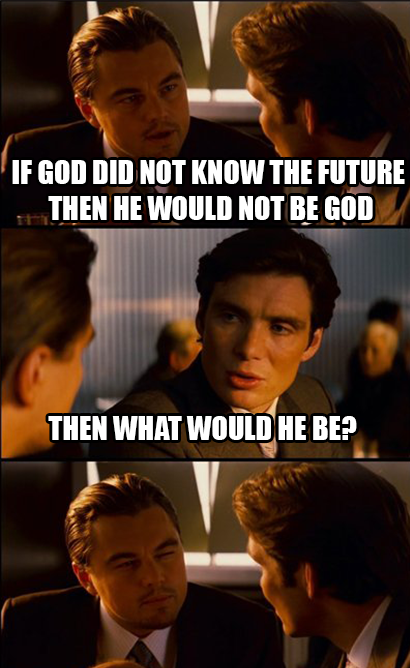 When Non-Christians (or even Christians) ask Christians if God can do/know/be/have something, often the response is “of course He does because He is God.” Or the phrase might be in the form of a negative “if God did not do/know/be/have something then He would not be God.” This is a form of the logical fallacy of Begging the Question (assuming a premise without evidence). This is also a wholesale rejection of Jewish theology. Hebrew theology starts with the premise that Yahweh is God. Yahweh’s characteristics are determined through the examination of Yahweh’s thoughts and deeds. Only after a wide array of Yahweh’s thoughts and actions are examined does Hebrew thought assign predicates to God. God is not powerful “because He is God” but because Yahweh created the universe, freed Israel from Egypt, parted the Red Sea, and many more power acts. The power acts are surveyed and a general attribute is established. Greek theology starts with the premise that god is defined by a series of attributes. These attributes are deduced through logical proofs. The attributes are usually based on quantifying god. How much power does god have: “all power”. Where is god: “nowhere” or “everywhere”. God is described through negative attributes (attributes that distance from creation) rather than qualifying attributes (attributes in common with creation). In Greek theology, any action or act by god is then filtered through these attributes. If omnipotence declares that god can do anything, then all acts are interpreted in this light. If God frees Israel from Egypt, that is because god can do anything. If immutability declares that god does not change, then any event that appears like a change must be reinterpreted. In Genesis 6, God does not repent of His own actions of making man, but is instead said to grieve over an event He already knew would happen. The Old Testament, in its discernment of Yahweh, is relentlessly committed to the recognition that all of reality, including the reality of Yahweh, is relational, relative to the life and destiny of Israel. And the God of Israel has no propensity to be otherwise than related to Israel. When Christians object with the phrase “… then He would not be God” they are engulfed in Greek mode of thought (for a famous author doing this, see AW Pink). These Christians are assuming attributes that make God the God-being. These attributes, as shown from the diversity of religions in the world, are highly speculative and arbitrary. It also functions as a rejection of the Bible, which is a highly Jewish document bred in Jewish theological thought. The Bible does not attempt to reinterpret the text in light of overriding attributes. Thus, while God is described as being longsuffering and having infinite mercy (1Ch 16:34; Psa 106:1, 107:1, 118:1, 136:1), the text allows God to show a lack of mercy to King Saul (whose repentance was rejected by God), Pharaoh (who was singled out for destruction), and Ananias/Sapphira (who committed an infraction and was not given a chance to repent), to name a few. This is an important point to make. A reader cannot just copy and paste various phrases about God that are found throughout the Bible and then form a Systematic Theology from those phrases. Those phrases, in themselves, are usually generalities formed with counter-examples in plain view. To make those phrases absolute and then deny the counter-examples would be proverbially “putting the cart before the horse”. It is a great mistake to engage in Greek theology when the Jewish theological tradition stands in stark contrast. The Bible tells people God’s character through God’s acts and thoughts. The Bible does not allow overriding principles of what God “should be” to override the narrative or testimony about God. Any argument premised in the fashion that “God would cease to be God, if true” should be rejected as pagan reasoning. This entry was posted in Bible, Christian Cliches, God, Immutablility, Omnipotence, Omnipresence, Omniscience, Theology. Bookmark the permalink. I disagree with this article. Here is why. The reason I would site for greek theological terms within theology is that the early Church spoke greek. They were merely named the theologies founded in the Bible, for example, the Shema [Deut 6:4] which tells us the Lord is one, leading to the doctrine of the Trinity (along with other verses). Or Omnipotence, which tells us that as Creator and Sustainer of the world God has power over all creation; this wasn’t in my opinion reasoned back from nothing but rather stated as a summation of what is showed Biblically in passages like [Job 38-40], or in the theme of God’s control in all things throughout the Bible. Take immutability for example, is shown to us in [James 1:15]- “the Father… with whom there is no variation or shadow due to change.” This is a Biblically founded statement, that if we want to uphold, we must interpret as true in all cases. God being all-merciful however, is not something stated in doctrine to my knowledge. Rather, God’s mercy, like many of His other traits is contingent of His love. In other words, God is love, therefore God does this… In the case of mercy, we find that sometimes “I will be gracious on whom I will be gracious, and will show mercy on whom I will show mercy.” [Exodus 33:19] God is not “all-merciful” rather, as John states [1 John 4:8], God is love, therefore, God is merciful when it is loving and just to be so, and not merciful when He deems it is not. What is love? We all know this one from [Corinthians 13]. It seems then, that the Bible does tell us who God is, and not just what He does. God is, in the Bible and in theology, both of immanent and economic reality, that is that he has qualities of who He is, like that He is omnipotent and omnipresent and omniscient (all founded in scripture by the Church Fathers) and that He has actions that show who He is, like striking down Annanias and Saphira and the Crucifixion. Therefore, it is our job to understand God as who He says He is, and what He does, and that is why we have terms like this. So we are not using greek theology to interpret Biblical truth, rather we are showing what parts of greek theology, that is in terms, are true with Biblical truth. After all, all truth is God’s truth! That is why we see some Church Fathers revising Plato so that they could have a philosophical view of the world that fit with the Biblical, and so they could understand and argue with the Pagans! To answer the age old question of Tertullian, “What has Athens to do with Jerusalem?” (in that what has philosophy and science to do with the Bible and Theology?) well, Jerusalem must convert Athens, and therefore, it must understand Athens, and speak in ways it can understand. Greek terms were for a Greek Church, but they were still Hebrew ideas. Psa 78:41 Yes, again and again they tempted God, And limited the Holy One of Israel. Num 14:27 “How long shall I bear with this evil congregation who complain against Me? I have heard the complaints which the children of Israel make against Me. The stories and verses can be multiplied indefinitely showing that God is being astounded and frustrated by man’s rejection of Him. Augustine rejects all of this, because in his view God is omnipotent, which entails not enduring something God does not wish to endure. So, is this what the Bible infers about God’s relation with the world? Is this what the Bible means by God being Almighty. You see the Greek thought does not look to the Bible to draw a general overview and then label with general (but not absolute) predicates. Greek thought defines what God “should be” and then forces the text to comply. Jas 1:17 Every good gift and every perfect gift is from above, and comes down from the Father of lights, with whom there is no variation or shadow of turning. Jer 15:6 You have forsaken Me,” says the LORD, “You have gone backward. Therefore I will stretch out My hand against you and destroy you; I am weary of relenting! Because you are ingrained in Greek theology, you are searching for prooftexts (which you take mechanically), which then can prove your predefined metaphysics. That is the point of this article, to point out the fallacy you commit in your post. James, a Jewish author, did not think like that. God has been shown throughout the Bible as very stable in God’s blessings and curses and the reasons behind both. James is stating the trend. In Jewish thought, this does not disallow slippage. God can repent or change from time to time while still being stable. In fact, this is normally how you and I communicate. Our coworker is “unwavering in their work ethic” although by saying this we in no way mean that he has never slacked off in his life. Edit: One such slippage is Job. James 1:17 is about God consistently giving blessings to the righteous, but Job received pain and family death. Thanks for your time and response Chris! I’m sorry to say that I actually only disagree more after hearing your clarifications and supports. Firstly, we cannot suppose to read the Bible “purely” that is without philosophies and intellectual contexts; nor it is desirable to do so. We read it primarily from the context of the ancient Church and it’s council and interpretations, leading to things like the Trinity, impassability, the divinity and dual nature [hypostates] of Christ and so on. You also read it as part of the latin church, focusing on law (that is guilt and justice, debt and credit, righteousness and payment and so on) rather than the eastern ideas of light and dark and life and death and spirit and matter. Furthermore we read as protestants, thinking in different ways about sacraments salvation and works. We also think in line of modern philosophy following Descartes and the culture of White Christian America. Try to separate yourself from that; for if you are to throw off the Greek which alters your reading, you need to throw those off as well. Rather, scripture should speak into our lives and thought, and mold them rather than be the only truth we accept. All truth is God’s truth. Furthermore, though you could site more and more verses where God contradicts Himself, He seems to think He doesn’t. In the book He inspired, the Bible, He tells us things like “They will perish, but you endure, they will all wear out like a garment. You change them like clothing, and they pass away; but you are the same, and your years have no end.” [Psalm 102:26-27], “I the LORD do not change; therefore you, O children of Jacob, have not perished.” [Malachi 3:6]. Those of us who argue for immutability argue with scripture as well as you do, so it seems that we disagree on something else that then leads into how we read scripture, which is clearly, philosophy, the very thing you wish to reject. Yet, you use it to reject it. If we are to say that God can change, that He can say one thing about Himself or do one thing and then do another opposite of what His character is, then we loose God. All the sudden we cannot define who He is, we can only see what He has somehow for some reason done. But there is no continuity to it. Sure He died on the cross, but He also raised Sodom and Gomorrah. Who knows what He’ll do next! If we cannot define God, if He is not constant, then we do not know Him, which seems to be the very reason He gave us the Bible, and died for us. Rather than worship a shifting shadow we are to worship something very different than what man is. John tells us God is love. Therefore, we know that all acts He does must be through the lens of love. This allows us to know that He has been, is now and will forever be loving and we can then worship Him for who He is. Now of course, this can seem hard in cases like Sodom and Gomorrah, after all it doesn’t sound like love. But that is our failure as sinful creatures to understand Him, not His failure to love. We could perhaps say that His love was in that as a warning, that it was perhaps utilitarian, that indeed none of those who were killed were righteous or maybe, that slow to anger was fulfilled and righteous and just wrath in love was necessary. It is hard true, but that is where we need to trust God for who He says He is, not doubt entirely everything about Him. In the same way, to compare God to the way we live “In fact, this is normally how you and I communicate. Our coworker is “unwavering in their work ethic” although by saying this we in no way mean that he has never slacked off in his life.” is downright wrong. He is perfect, we are not. We are stained by sin, totally depraved. We cannot say, this is how man acts, therefore God is similar. No, we say, this is how God acts, therefore we should. We are defined by God, not Him by us. We do not have to power to say who He is, only to react to who He has shown Himself to be through special and general revelation, which is an immutable, omnipresent, omnipotent, omniscient God. Finally, I would like to caution against simply throwing off two-thousand years of Church philosophy now. It seems to me to be a little self-centered to so clearly state that the Church Fathers, that Luther, the Calvin that Aquinas and even many theologians now are simply wrong. It also seems arrogant to be so definitive as someone who does not even have a doctorate and is arguing on a blog rather than an academic journal. Neither of us has the right to be so sure and definitive; we are simply not qualified. This doesn’t mean that we can’t have opinions, and I also am not chiding nor calling you arrogant, I simply want to warn against appearing to be the only right on a blog that is more often than not limited to social media. It’s great to spread thoughts, I encourage it, and i encourage you as a brother in Christ for talking about these things, but I ask you leave from for doubt and disagreement; we talk about sensitive things when we talk about the savior of the earth. In total, I am simply saying this; you ask us to throw off something we cannot; how we think. You also ask us to accept that we cannot know God, which leads me to ask what I am to worship, and you attempt to understand God through what we do, which is to me, an affront to who God is. So I would like to say, I respectfully disagree, and I think I have the right to as do many others. Rather, I think God wants me to know Him, and wants to work in my life, in the way I think and where I am now. I believe He wants to take the 21st century white american Jake and mold Him to His will. Not make me a first century jew in order to understand who He is. (even then first century jews would have thought within a hellenistic lens as we can see in the apocrypha). Here is the point of the article: that modern Christians are using Greek thought rather than Jewish thought to interpret the Bible. You are illustrating Greek thought in your responses. You are trying to single out very specific phrases and then try to draw out absolute principles from them, by which you then reinterpret everything else in the Bible. That is really not a valid mode of operation, not just because it is Greek thinking, not just because it is a logical fallacy of “begging the question”, but also because it violates reading comprehension skills. Language does not function with hard and fast mechanics that allows single phrases to have definite meaning apart from contextual clues. Any single phrase, by itself, can entertain a host of meanings. A valid Systematic theology must consider all the evidence with longer narratives taking precedence over chance phrases. In fact, this is how standard Jewish theology functions throughout the Bible. When you try to overrule countless verses with a single verse, this is a departure of normal reading comprehension standards. You would not treat any other book in this fashion. How does it logically follow that Israel is not destroyed because God is utterly immutable? In fact, all your prooftexts are loaded with assumptions that are contradicted by the context of the verses. It is bad interpretation, and it is because you have adopted a Greek mode of thought where you are looking for “proofs” of Negative Theology. A further note: You have to remember, most Church Fathers were separated from Jesus by hundreds of years. Imagine someone saying that you are a good representation of someone who lived in 1915. This problem is compounded by the fact that the ancient world did not have the communication network that we now enjoy. In fact, we have better access to (and more) information than they ever had. We also have to discount their views because they show a consistent dedication to Platonism over the Bible. When the Bible contradicts Platonism, they accept the Platonism. The Greek Platonists did the same to Homer. Did the author of Genesis 18 believe in omnipresence and omniscience? Where can I go from Your Spirit? Or where can I flee from Your presence? If I ascend to heaven, You are there; If I make my bed in Sheol, behold, You are there. If I take the wings of the dawn, If I dwell in the remotest part of the sea, read more.Even there Your hand will lead me, And Your right hand will lay hold of me. If I say, “Surely the darkness will overwhelm me, And the light around me will be night,” Even the darkness is not dark to You, And the night is as bright as the day Darkness and light are alike to You. “Am I a God who is near,” declares the LORD, “And not a God far off? “Can a man hide himself in hiding places So I do not see him?” declares the LORD “Do I not fill the heavens and the earth?” declares the LORD. Neither is there any creature that is not manifest in his sight: but all things [are] naked and opened unto the eyes of him with whom we have to do. Maybe it’s just me, but it seems that the authors of the Bible must be very confused that they claim one moment God must go down and the next that you cannot flee from Him, and as well claim one moment that God knows not and the next that He knows all. So, are they confused and contradictory which we expect even men not to be let alone God, or does He merely illustrate His attention with the words in Genesis 18? Or perhaps we must merely consign that we believe a lie. Jake, thank you for the response, but that was not my question. My question was not about “authors”. My question was: did the “author” of Genesis 18 believe in omniscience and omnipresence? It is a yes or no question, and the author did not have the benefit of Psalms 139 to read when writing his text so we just cannot appeal to a text written hundreds of years later and then ripped out of its own context. Do you see anything in the text or other text written by this author to suggest omniscience or omnipresence? Or is there not a glancing familiarity with the concepts? The quote is by God. This is God speaking. Please do not misrepresent God. So, does God, in the text, know for certain if the outcry against Sodom is true? The other verses are by God too. I do not misrepresent Him by merely repeating what is written in the scriptures. If it is God speaking in both -which I agree it is- then He either is confused, untrue, or means something entirely different than what you think. Actually, the Psalms verse is by King David. And btw, speakers in the Bible can be and have been wrong. God and the narrator are not “wrong”. It is only your theology that then forces God to be wrong in His statements. You are forced to overwrite the Bible to hold on to non-Biblically based attributes. What do you gain? If you read Psalms 139, it is not about omnipresence. In fact, David begins the chapter amazed that God is so far away yet He knows David. David ends the chapter asking God to test David to learn David’s heart. Your omnipresence prooftext that you take out of context (because of dedication to Greek philosophy) is about God protecting King David wherever King David goes. There is not a general applicability to all mankind, much less reason to take this passage as “physical location”. As a summary, you misrepresent Psalms 139 such that you can also misrepresent Genesis 18. It is not intellectually honest theology. I am really stressing reading comprehension. When we read statements, the statements do not stand alone. Language is vague and must be interpreted via the context. If you read through King David’s writings (and he is very prolific), there is a sense that he did not buy into omnipresence. King David describes God as in Heaven, looks up to pray, etc. Did the author portray God as not knowing the conditions in Sodom? First off, when I read Psalm 139 I get none of the impressions you have, so I can’t agree with any of your criticisms of that much like I read Malachi differently. In the same way, when I read the story of Sodom and Gomorrah I do not see a God who physically descends on the city, nor needs to learn whether people are indeed responding to the outcry, but rather (as you would harshly mock in poor taste as shown by the Calvinist video) God indicating His work in an area and a people. Quite like when He asks Adam and even what they had done in the garden. Regardless, I feel like we are tiring out this debate. Many of my questions and points in my opinion remain unanswered, and you make the same one despite what I believe are valid arguments. It is clear we have vastly differing interpretations of scripture based off of vastly different basic philosophies and theologies (Yes you do have a specific line of philosophical and theological thought whether you like it or not). The point I want to make in the end is simply this; we cannot write off each other’s opinions. While I think you are wrong to the upmost, we can disagree, but neither of us, especially if you are making a blog post to be shared, should make it appear as if you know the right answer, and I am stupid for believing otherwise. From Schleiermacher on your side to Augustine on mine, many smarter than us have disagreed. So, can we agree to disagree? You realize the point of the video right? The point is that we cannot take statements and rip them from their context, assigning wholly unwarranted interpretations to the text. As I have said before, any single phrase cannot have definite meaning apart from context. This point is not about the Bible. This is a point about how languages basically function. You cannot make definite and absolute claims based on fleeting phrases. In the Sodom text, we have a narrative: God goes to Abraham and blesses Abraham. God then queries Abraham about God’s next move, which is to go to Sodom, see if it is as wicked as it is rumored to be, and then to destroy Sodom. Abraham functions to temper God, insuring that God will not kill the righteous along with the wicked. The text represents Abraham and God having a genuine dialogue about what God may or may not find. There is no hint of Negative Theology. In fact, the author has no familiarity with Negative Theology (with this in mind, why would King David think in terms of Negative Theology). You reject the entire narrative, everything about it. You do so because of your dedication to Greek philosophy. But narrative accounts just do not work like that in the Bible. The text was to be taken on face value. While it is easy to reject a specific interpretation of a single phrase, you can’t just deny the narrative. And there are countless narratives in the Bible you are forced to reject. For what? What does Negative Theology gain you? You say it is like God, in the Garden, asking Adam where Adam is. Here is a question to you. Can the text support an interpretation where God does not know where Adam is? This is an intellectual honesty question. List out your unanswered questions, and I will answer every one. I did a text search on “?” and I only come up with questions that I asked you and you did not answer. You really need to start showing some integrity. This is not what I’m arguing; I know that I am using “Greek terms and philosophy”, as you agree so did Athanasius and Augustine and Ireneus and so on. Even Paul in Romans and Acts knows that he uses what you call philosophy and what I (and countless others) call Theology. I am merely arguing that using Theology in order to understand what we can say about God and who He is isn’t wrong, and isn’t even close to fallacy. One great example is the Trinity; if we didn’t have Theology, philosophy and Greek thought we wouldn’t have the definition of the Trinity in the Nicene creed by which all Christians must confess in order to be called part of the Church in nearly every denomination.